Ski center Hordní Domky is located in Rokytnice on the southern slopes of Bald Mountain at an altitude of 630 – 1.315 m. By its area and first class ski slopes (longest in Czech republic – lenght 3,5km) it can compete with smaller ski centres in Europe, because of that it is rightfuly one of the most popular ski centres in the Czech republic. It is particularly popular for great diversity and size of ski slopes. For fans of snowboarding there is a snowpark ready, which is equipped with several jumps and various obstacles and small pole lift. It is mainly popular with fans of freestyle. Ski resort Horní Domky provides skiers and snowboarders a total carrying capacity of 7,620 person / hour thanks to two four-seat cable railways and six bar-lifts. The new cable railway was built in 2006 and the exit station is right at our apartment. It leads from the parking “u Rokytky” directly to the Wellness Luxury Apartment and cottage Lovčenka. The second cable railway to Lysa hora, which was built in 1996, is unique in that it is the only one in the Czech Republic that leads into the first zone of the national park. The final station is the starting point for cross-country skiing track Krkonošská magistrála. The center is equipped with artificial snowing technique. In the absence of snow it helps cover 90% of ski slopes with 7 snow-making guns and 11 poles. The resort offers other services that are available either in the area or in its immediate vicinity. There are ski rentals and ski-services, restaurants, fast food restaurants, ski schools, paragliding, mountain rescue, ski bus. The non-skiing visitors can try snowtubing – very exciting slide down a artificial snow track tube in inflatable rings. Parking is available in four central car parks (P1 – P4). From two car park there is a skibus that transports visitors into the ski center. 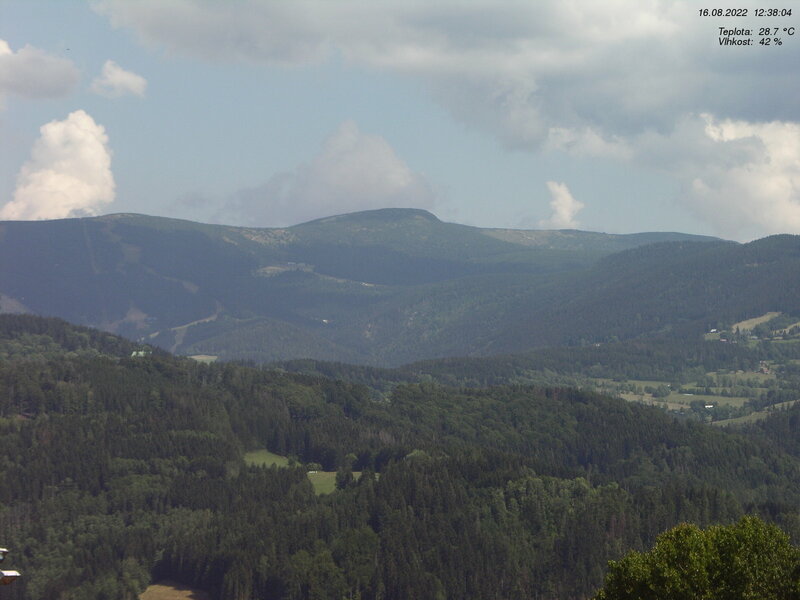 Harrachov is situated in the western part of Krkonoše on the border with the Jizerské Hory in the valley of the river Mumlava. Its mountain conditions are caused by the introversion of the south side of Čertova Hora and the relative openness from the north direction trought the Novosvětský průsmyk make it a center of winter sports and recreation. Eventhought altitude 680 m above sea level (at the church) is not overwhelming, but there is some truth to the old-timers claims that in Harrachov is cold for half of the year and freezing for the next half. With this configuration of terrains, which are also suitable as ski slopes, Harrachov gradually grew to being a skicenter known across the globe, providing services for winter sports at a high level. Harrachov can offer a variety of slopes of varying difficulty with artificial snowing with two four-seat cable lifts to the very top, many kilometers of groomed cross-country trails and paths up to the mountain ridges of Krkonoše, a number of training spaces for skiers-beginners and children, many ski schools with experienced tutors and lots of skiing equipments rentals.